Manuring and fertilizer application is critical for proper establishment and growth of plants. Manuring pepper vines is to be done in bands around the vine, at 30-75 cm away from the base of the vine, depending upon their growth. Apply 10 kg of decomposed cattle manure / compost / green leaves and 1 kg neemcake per plant with the onset of southwest monsoonand 5 kg of decomposed cattle manure and 1 kg neem cake per plant at the onset of northeast monsoon and cover lightly with soil.It is desirable to apply lime or dolomite @ of 500 g/vine in April-May, with the receipt of pre-monsoon showers(April-May), in alternate years only in acid soil conditions. Apply biofertilizer products of Azospirillum (50g/plant), Phosphobacteria (50g /plant) and VAM (100 g/plant) along with decomposed cattle manure during May- June. One more dose of biofertilizer, Azospirillum (50g/plant), Phosphobactor (50g/plant) may be given during September-October along with organics. Apply biofertilizers in a circle of radius 30 cm around the vine. Biofertilizer products may be applied along with farm yard manure/compost with a time gap of 15-20 days before chemical fertilizer application. Manuring and fertilizer application for pepper has to be done for proper establishment and growth of vines. Proper soil testing may be done prior to fertilizer application to know the soil fertility and site specific fertilizer recommendation may be adopted. Recommended nutrient dosage for black pepper vines (3 years and above) is NPK 50:50:150 g/ vine/year (General recommendation),Only one-third of this dosage should be applied during the first year which can be increased to two-thirds in the second year. The full dose is given from the third year onwards. It is better to apply the fertilizers in two split doses, one in May-June (pre-monsoon) and the other in August- September (post-monsoon) and sufficient soil moisture must be ensured. If the soil is high in any of the said nutrient the recommended dose may be reduced to half or one third . The fertilizers are applied at a distance of about 30-75 cm all around the vine and covered with a thin layer of soil. 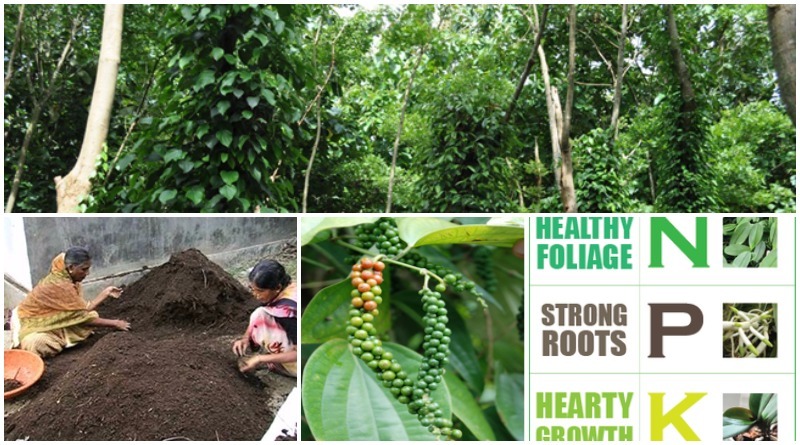 Care should be taken to avoid direct contact of fertilizers with roots of black pepper. When biofertilizer like Azospirillum is applied @ 100 g/vine, the recommended nitrogen dose may be reduced by half to 25 g/vine. In soils that are deficient in zinc, magnesium foliar application of zinc sulphate 0.25% ZnSO4 twice a year (May-June and September-October) soil application of 150 g/vine magnesium sulphate respectively are recommended.Otherwise spray black pepper micronutrient mixture twice in a year for correcting the deficiency.